This week's Goldbergs takes on The Fresh Prince (Will Smith) and DJ Jazzy Jeff's classic Parents Just Don't Understand, and Murray's not a big fan. Because his kids are morons. Adam and Barry are watching Will Smith's Parents Just Don't Understand music video when they decide to become a rap duo. They want cool rapper clothes, but Beverly is super uncool so she makes them wear boring stuff. She's a parent that just don't understand. Erica arrives at her dorm to find that Beverly has left 49 (not 50, like Other Erica claims) messages, and each one gets more and more insane. She still won't call her, but she accidentally picks up. She hangs up, but this makes Beverly freak out even more. Murray tries to calm her, which doesn't work because she's nuts. Adam and Barry are brainstorming hit song titles, but they're trouble. Barry keeps coming up with Parents Just Don't Understand copies, and then Murray comes to yell at them. He gives Barry an idea for a song called Dads Just Don't Care. Beverly gets Jeff into her car by telling her Erica's in grave danger, and then has him call Erica. He's been given questions by Beverly, but they're super gross and weird. Barry and Adam interrupt, and Jeff craters and freaks out. Erica figures it out, because she' have to be an idiot not to, and she tells Beverly to never call her again. Barry and Adam unveil their masterpiece to the JTP. It's not very flattering for Murray, and the JTP is speechless. Even they know that it's mean and hurtful. They've also given Murray a copy, and he's angry because of what they said. He tells them off, and they somehow only then realize that the song is really mean. Beverly isn't giving up, and Erica finds out. She decides to drive to check on Erica, because she gets suspicious. Barry and Adam decide to write an apology song for Murray, and they get to work on it. At college, Beverly arrives to spy, though Erica is going through a different crisis. Other Erica tells her she's acting like a mom, and then Erica acts just like Beverly. Barry and Adam reveal their apology rap to Murray, who still isn't impressed since their only positive thing is "he pays for stuff." Murray also says that he's so upset because his dad REALLY didn't care. About him, his brother, or anything, really. The boys try to apologize again, and speak from the heart this time. It starts out with insults, but it eventually gets to the sweetness the show is known for. He accepts their apology and they embrace, but Murray calls him a moron because of course. Beverly takes care of Other Erica, and they both start to realize that they were wrong. Erica lets Beverly call her, and Beverly decides to let Erica actually live without bugging her constantly. This was a thoroughly enjoyable episode. I loved Barry and Adam's story, and thought it was nice to see a different, cursing side of Murray. Usually it's Beverly that freaks out and curses her kids out, but this time it was Murray, and it was hilarious. Both of the kids' apologies were hilarious, especially the music video. Erica's story this week was significantly better this week, though I'm still not enjoying her college adventures quite as much as her ones at home. Other Erica is starting to grow on me, though. I also loved to see Erica morph into Beverly this week, acting like the overprotective mother she always complains about herself. I also found the real phone messages from the real Beverly to be even funnier than the scripted ones. 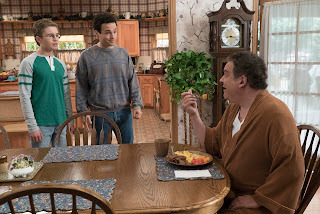 Seriously, how did Adam F. Goldberg survive this family?